Seagrass meadows, found in shallow waters on the coast, are known for being one of the most productive ecosystems in the world. They provide critical nursery grounds for fishes, filter water, stabilize shorelines, and absorb an outsize amount of carbon, potentially reducing ocean acidification. Yet seagrass has been hard hit by coastal pollution and development. California Sea Grant has been supporting research on whether Californians can benefit from – and bring back – key seagrass beds along the coast. Just west of San Luis Obispo, Morro Bay is one of 28 estuaries that the U.S. Environmental Protection Agency has designated as critical to the economic and environmental health of the nation. Once dominated by eelgrass (Zostera marina), Morro Bay has been the site of an astonishing collapse: since 2007, eelgrass has declined by 95 percent, from covering 344 acres to less than 15 acres. After initial attempts to restore the lost eelgrass failed, California Sea Grant Extension Specialist Jennifer O’Leary set out to understand why and look for solutions, convening a working group with the Morro Bay National Estuary Program (MBNEP) and six researchers from Cal Poly San Luis Obispo. Their initial findings have ruled out several community hypotheses for the decline, including drought, temperature change and overgrazing. Although the decline remains a mystery, the team is moving on multiple fronts in hope of restoring eelgrass beds – tracking conditions in different parts of the bay, checking the genetic diversity of the remaining eelgrass, and evaluating ecological consequences of the change. O’Leary will work with the California Department of Fish and Wildlife and MBNEP to begin experimental restoration plots within the year. As their results come together, the working group hopes to develop a successful restoration plan. Estimates suggest seagrass beds occupy just 0.2 percent of the ocean seafloor, but account for 10 percent of all carbon captured annually in the ocean. Accordingly, seagrass has gained attention for its potential as a carbon sink. In California, a bill to establish an Ocean Acidification and Hypoxia Reduction Program (SB 1363), with an emphasis on eelgrass research, has passed the Senate and is currently under review in the Assembly. 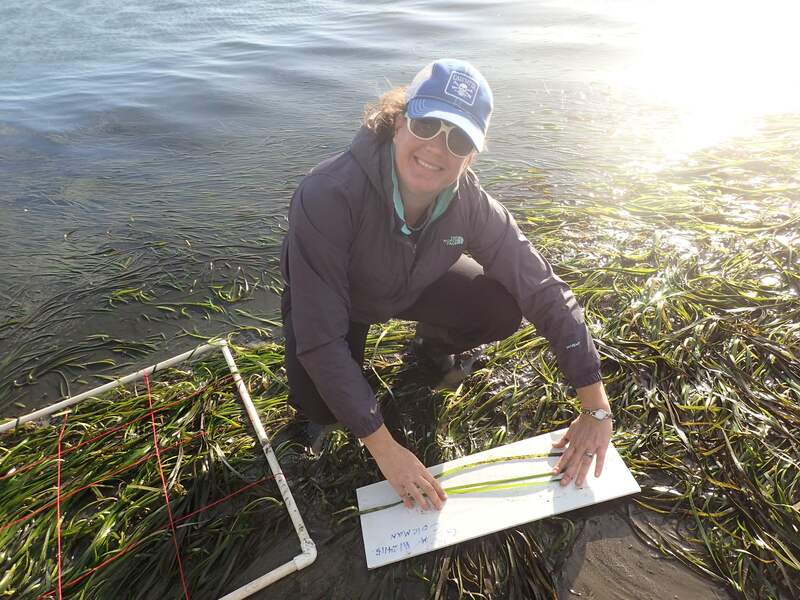 With support from California Sea Grant, Dr. Tessa Hill and colleagues at UC Davis have tested the efficacy of seagrass meadows for reducing ocean acidification in Tomales Bay, the site of at-risk commercial shellfish farms. Their results showed seagrass beds may reduce or raise seawater acidity depending on biomass and season, and organisms within the beds experience higher swings between nighttime and daytime acidity levels. As a member of the West Coast Ocean Acidification and Hypoxia Panel, Dr. Hill has briefed this research to California legislators, the CA Ocean Protection Council, and the CA Secretary of Natural Resources – including specifically addressing ocean acidification legislation currently in consideration. Hill is currently working with 27 researchers to summarize the research and develop recommendations on how seagrass may be used to address ocean acidification. Estimates suggest that just five estuaries support over 80 percent of the known eelgrass in California: Humboldt Bay, San Francisco Bay, San Diego Bay, Mission Bay and Tomales Bay. Fortunately, our knowledge of these systems stands to increase thanks to the Ocean Protection Council’s Marine Protected Area Baseline Monitoring Program, administered by California Sea Grant. Monitoring projects under the program including one in Humboldt Bay – where Dr. Frank Shaughnessy of Humboldt State University is collaborating with academic scientists, North Coast tribes, and ecological consultants to evaluate focal species such as bivalves, eelgrass, and black rockfish. In Southern California, seagrass meadows will be included in new maps of the tidal zones being created by scientists with San Diego-based Ocean Imaging Corp.
Taken together, these scientists are shining a light onto the future of seagrass in California, one refuge at a time.